Written by Colin Nederkoorn on February 12, 2019 . Building on our work from 2018, we started January with personal resolutions we knew we would break, but a commitment to you that we knew we would fulfill. This year we’ll continue to build the most powerful automated messaging tool on the market while reducing the time it takes you to create value in Customer.io. In January we did this by adding “Wait Until” to give you more flexibility in campaigns. We also improved working with segments by making it possible to drag-and-drop the conditions as well as giving you the ability to “archive” segments you’re not using. A hotly requested addition last month was bringing you visibility into your email “suppression list.” Rather than emailing us to help, you can now remove addresses that get blocked and suppressed from sending. In a typical campaign, you might send a message and then add a time-based delay—usually a day or so. With our “Wait Until” action, people get paused in a campaign until they do something you define or time elapses—whichever comes first. You can wait for them to confirm their email address before proceeding. You can wait for them to download your app. You can wait for them to convert to a paid subscription. Wait Until allows you to do more in a single campaign flow. You’ll never get stuck with a condition in the wrong spot again. You’ll never have to start creating from scratch when the order of things doesn’t tell the story you want. Now, you can drag segment conditions to re-order them. You can drag them into a group, or out of a group. Anywhere conditions can go, you can now drag them there. We hope you’ll agree that this makes creating segments more forgiving and more fun. In order to stay organized and better manage your list of segments, you now have the ability to archive segments you are no longer using. For our customers with over 1000 segments, this one’s for you. We’ve heard from a lot of you that you often send newsletters to people who have (or haven’t) received a different newsletter. Previously you had to create a segment. We streamlined that process. 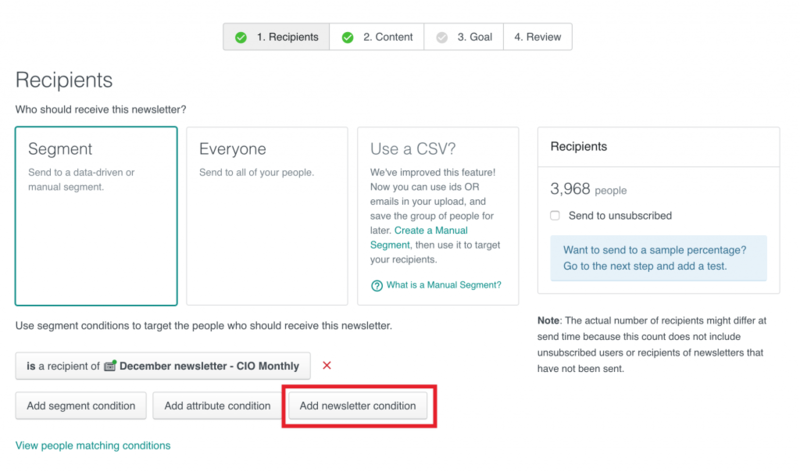 Now when selecting recipients for a newsletter, you can choose to send it to people who have or haven’t received any of your other newsletters. Email Settings now has a new “Suppression List” tab. Here you’ll find emails that have been suppressed by our delivery provider for past bounces, blocked, invalid, or emails marked as spam. When needed, you can easily remove emails so they’ll no longer be suppressed. We’ve added a new check that points out a common HTTPS error when configuring Link Tracking on a custom domain. When using the “Do Not Send” feature within workspaces, we’ll now mark attempted messages with an “Undeliverable” status. When testing new ideas or temporarily pausing messaging, the delivery log is much clearer. We’ll see you next month! In the meantime, stay updated with the latest releases and improvements by following Customer.io on Twitter. Questions? Comments? Send them over to win@customer.io.